Eli Roth is back in the saddle again gorier than ever before. Prepare to see some of the most disturbing images you'll see on the big screen this year. For those that don't know the struggle Eli Roth went through not only to make this film but to release it I’ll shed some light. Roth originally set this film to release last year fall 2014 yet at the last moment petitions by activist thinking the film was nothing more than an onscreen "Snuff Film" convinced the studios handling the films distribution to back out. Now we can all imagine how frustrating it must be to be a week away from release and then your distributor backs out, how do you get it to theaters across the country? Thank goodness Eli Roth found a way, showing us that nothing can stop him. Going into "The Green Inferno" I wouldn't say my expectations as a film standing on its own were high at all but as an Eli Roth fan my expectations were through the roof. I was completely satisfied with what I saw and it now stands as one of my favorite Eli Roth films. The plot of this beautiful bloodbath follows Lorenza Izzo who plays Justine a college student who in the hopes of proving to the leader of a nature activist group that she is more than just a voice, heads to the amazon along with a few others to try and save a tribe and the forest itself from being demolished. The plot is simplistic for a horror movie and at first "The Green Inferno" doesn't feel like a horror movie. The pacing creeps for the first half yet once the gore starts it doesn't let up one bit. Aside from the story, I found so many other things intrigued me here. The actual tribe that is shown in the film is actually a real tribe cut off from society yet they aren't actually into "Cannibalism. I felt it was such a great idea to go out into the amazon and ask a fellow tribe to play a tribe in your film to make all the more realistic in the customs and wardrobe. Focusing more on the effects of the film I have to give so much recognition to Gregory Nicotero for making the effects look so real it’s sickening to the stomach. The effects are something that really set the tone for "The Green Inferno", adding the authenticity of the actual tribe and some really gorgeous gore effects it’s hard to tell at times if they actually did certain things. From the much inspired film "Cannibal Holocaust", Eli Roth really brought the essence of that film and made it his own. The camera work was very gritty and I think Roth even goes the extra mile with the beautiful set designs. 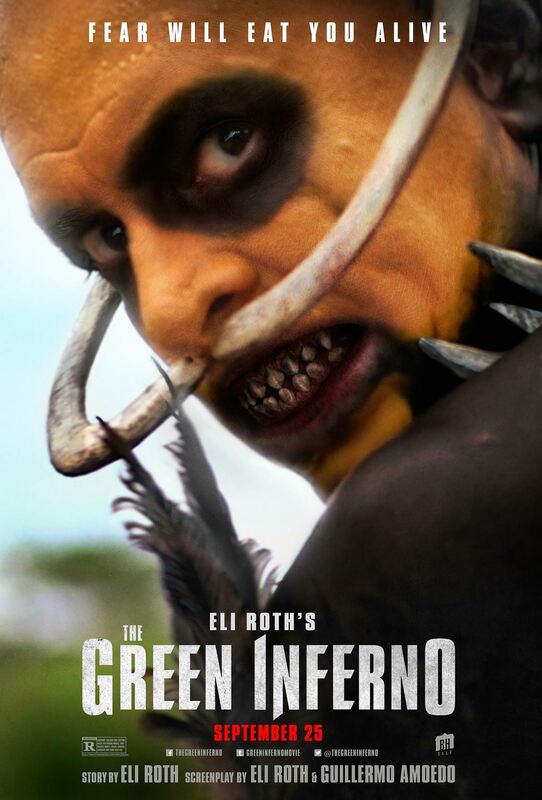 All in all "The Green Inferno" has everything a Roth fan needs to love his latest entry. "The Green Inferno" is dark, gritty, bloody, and has a great cast complimented with a natural performance by Lorenza Izzo and the rest of the cast. This year 2015 Eli Roth will be releasing two films and this is the first to step up to the plate delivering everything I wanted. Very excited to see how Roth tackles the "Thriller" genre later this year but for now "The Green Inferno" delivers for horror fans.